Technical - Bentley's Antique Auto Service, Inc.
Driving a Ford Model A. This article on how to drive a Model A Ford was originally published in 1928. Driving the Model A was a totally different experience than the Model T was. Filling the Radiator—Before starting the car, see that the radiator is filled with clean fresh water. The cooling system holds approximately three gallons. If in winter, use anti-freeze solution (procurable from any Ford dealer). As the proper cooling of the engine is dependent upon the water supply, it is important particularly with a new car to see that the radiator is kept well filled. Any steaming causes loss of water as will leaks in hose or radiator. Filling the Gasoline Tank—The tank has a capacity of ten gallons. The gasoline gauge on the instrument board panel indicates the amount of gasoline in the tank. Gasoline can be drained from the tank by opening the petcock in the sediment bulb located on the engine side of the dash. The screen in the gasoline tank filler neck should occasionally be removed and cleaned. IMPORTANT— After cleaning be sure to replace this screen. Also see that the small vent hole in the gasoline tank cap does not become clogged. If the vent hole is clogged the gasoline will become air bound and fuel supply will be irregular. Proper Oil Level— Before starting the engine, make sure there is a sufficient supply of medium light, high grade engine oil in the oil pan. If there is not enough oil, more should be added through the breather pipe located at the left side of the engine (a metal cap covers it). Five quarts of oil is the amount required in the oil pan. To determine the correct oil level, use the indicator, which is of the bayonet type, located on the left side of the engine just to the rear of the breather pipe as follows: Pull out the indicator—wipe it off—re-insert the indicator and again remove it. The mark made by the oil indicates its level. When the oil reaches the point marked "F" on the indicator, it is at the proper level. Under no circumstances should the oil be permitted to get below the point marked "L" as any attempt to run the engine with too little oil may seriously damage the parts. The letter ''F" indicates '' full,'' the letter " L" means "low." When replacing the oil level indicator, see that both the short and long ends of the indicator enter the opening in the crankcase. Failure to insert both ends into the opening permits the oil to leak out as the opening is not fully closed. Before Starting the Engine— Be sure the gear shift lever is in neutral position—i.e., the position in which it can be moved freely from side to side, as in any standard gear shift car. Advance the throttle lever, located under the steering wheel (right hand side), about three notches, or until the accelerator pedal moves slightly downward. Pulling down the throttle lever or pressing on the accelerator pedal, controls the quantity of gas entering the cylinders, and regulates the speed of the engine. In the Model T there was no accelerator pedal. Carburetor control was entirely by hand lever. Place the spark lever (left hand) at the top of the quadrant (the notched quarter-circle on which the lever is operated). This is the retard position. The spark lever regulates the timing of the spark which explodes the gas in the cylinders. Readers who are familiar with the Model T will note the changed location of engine controls. Always retard the spark lever when starting your car. Starting the engine with the spark advanced may cause the engine to kick back, and damage the starter parts. After the engine is started, advance the spark lever all the way down the quadrant. Theft-Proof Lock—The Ford type electro-lock used in the ignition switch is a combination switch and theft-proof lock affording full protection for the car and meeting the exacting requirements of the underwriters as regards theft insurance. To unlock the electro-lock, simply insert the switch key into the ignition switch and turn the key to the right. This releases the cylinder of the lock, which snaps forward and closes the ignition circuit. When the cylinder is released the engine can be started in the usual manner, AND THE SWITCH KEY WITHDRAWN FROM THE LOCK. To shut off the engine, push in on the cylinder of the lock until it snaps 'back in the lock position. This shuts off the ignition and locks the car in a positive manner. Starting the Engine—1. Release the lock cylinder by turning the switch key to the right. 2. 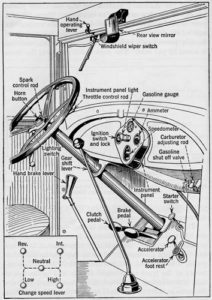 See that the spark lever is retarded; the throttle lever advanced three or four notches on the quadrant, and the gear shift lever in neutral position. 3. If the engine is cold, turn the carburetor adjusting rod one full turn to the left, to give it a richer mixture for starting. This rod serves both as a choke for starting and as an enriching adjustment. Next pull back the rod, at the same time pressing down on the starter button and release the choke rod; next advance the spark lever. When the engine warms up, turn the choke rod back to its normal position one-quarter turn open. When starting a warm engine, do not pull back the choke rod unless the engine fails to start on the normal mixture, as there is a possibility of flooding the engine with an over-rich mixture of gas. If you should by accident flood the engine, open the throttle and, with the choke rod in normal position, turn the engine over a few times to exhaust the rich gas. If you continue to turn the engine with the choke rod out the flooding will become greater and engine increasingly difficult to start. Starting the Car—Release the hand brake lever. With the engine running, disengage the clutch by pushing down the left foot pedal. Move the gear shift lever to the left and back, which is the low speed position as shown in insert in the illustration. Gradually release pressure on the clutch pedal, allowing it to return to its normal position, and at the same time increase the speed of the engine by pressing lightly on the accelerator. Second Speed: When the car has reached a speed of five to eight miles per hour, engage second or intermediate speed as follows: Release pressure on accelerator and again disengage the clutch, moving the gear shift lever through neutral to the right and forward, second speed position. Allow the clutch pedal gradually to return to its normal position, and increase the speed of the car until it is running 12 to 15 miles per hour. High Speed: Disengage the clutch as before; at the same time release the pressure on the accelerator and pull the gear shift lever straight back from second speed. Then engage the clutch and increase the speed of the engine, as driving conditions may require. Shifting Back Into Low Speed—When shifting from high to second speed, at car speeds not exceeding 15 miles per hour, there should be no hesitation in neutral. The lever should be moved as quickly as possible, from high to second speed. Should it be necessary to shift from high to second speed at higher car speeds, it can be done by the following method: Disengage the clutch and shift into neutral. Reengage the clutch and at the same time accelerate the engine; then disengage the clutch again and shift to second, after which disengage the clutch. With a little experience, this shift can be made quietly. Descending a Hill—When descending long, steep grades, have the transmission in gear, the clutch engaged, and the ignition switch on. This allows the engine to turn over against compression and act as a brake. On very steep grades the car should be in second speed gear before descent is started. On exceptionally steep grades the low speed should be used. This increases the braking action of the engine. Always leave the ignition switch on when descending an incline. Shutting off the switch allows raw gas to be drawn into the cylinders, which washes the lubrication off the cylinder walls. Also unexploded gas collects in the muffler, and when the switch is again turned on there is a possibility of blowing out the muffler, which has become filled with highly explosive mixture. To Stop the Car—Disengage the clutch by pressing forward on the left pedal and apply the foot brake by pressing forward on the right pedal. Except when a quick stop is necessary, it is advisable to apply the brake gradually. When driving on wet or slippery pavement the speed of the car should be reduced by applying the foot brake before releasing the clutch. This method of braking prolongs the life of the brake lining, and is a safety factor. In bringing the car to a final stop, keep the clutch disengaged until the gear shift lever has been moved into neutral position. To stop the engine, push in on the electro-lock cylinder until it snaps back into the lock position. The driver should endeavor to so familiarize himself with the operation of the car that to disengage the clutch and apply the brakes becomes automatic—the natural thing to do in case of emergency. To Reverse the Car—The car must be brought to a stop before attempting to reverse its direction. To shift into reverse, proceed as in shifting into low speed, except that the gear shift lever is moved to the left and forward. The Spark Control—For normal driving, drive with the spark lever fully advanced. When the engine is under a heavy load, as in climbing steep hills, driving-through heavy sand, etc., the spark lever should be retarded sufficiently to prevent a spark knock. This is a pronounced knock, which is sometimes mistaken for a worn bearing. Driving the Car—The different speeds as required to meet road conditions are obtained by varying the pressure on the accelerator, which in turn controls the motor. Practically all the running speeds needed for ordinary travel are obtained in high gear; the low and second speed gears are used principally to give the car momentum in starting, and when the engine is subjected to a heavy load. Caring For the New Car—A new machine requires more careful attention during the first few days it is being driven than after the parts have been thoroughly "worked in." To obtain the best results, a new car should not be driven faster than 30 to 35 miles per hour for the first 500 miles. The oil in the engine should be changed after this distance has been covered, as there may be a few metallic particles or sand in a new engine. Never start out with your car until you are sure it has plenty of oil, water and gasoline. See that an air pressure of 35 pounds is maintained in all tires. Under inflation causes more tire expense than anything else. Inspect your battery every two weeks and keep it filled to the proper level with distilled water. If the water is allowed to evaporate below the top of the plates the life of the battery will be seriously affected. Let the Ford dealer or expert Ford repairman go over your car once a month, making any mechanical adjustments necessary to keep your car in proper running order. Do Not Rest Foot on Clutch Pedal— Do not make a practice of resting your foot on the clutch pedal while driving, as this may cause the clutch to slip and unnecessarily wear the facing on the discs. This is called ''riding the clutch" and causes premature clutch trouble in any make of car. The correct clearance or play for the clutch pedal is approximately 3/4 in. That is when the clutch pedal is depressed there should be about 3/4 in. play in the pedal before it starts to disengage the clutch. As the clutch facings wear this clearance or play gradually grows less. Consequently it should occasionally be checked. Under no [[[circumstances should the car be driven without clearance or play in the clutch pedal.